A client of mine is struggling to deliver its new strategy. Despite setting a clear, overarching goal, agreeing the most important product categories to focus on and settling on product innovation as the key to the company’s future competitive differentiation, the executive team has seen little real progress. The reason for the limited results is clear. There is insufficient engagement and commitment to the strategy from the front-line teams. Strategy may be created top-down, but it’s delivered bottom-up and 90% of your implementation focus should be on developing, engaging and supporting your people to deliver. 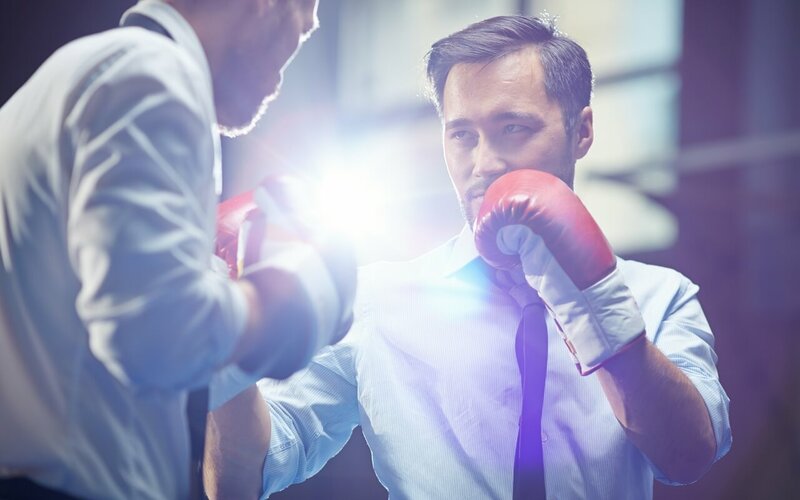 I’ve already written about how strategy development is a contact sport – see here – and the same is true for strategy delivery. 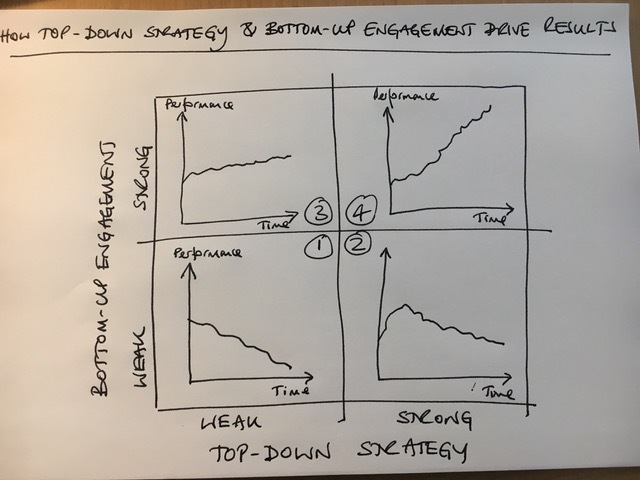 The chart, below, sets out how both effective top-down strategy and bottom-up engagement is required to deliver sustainable growth. Top-down strategy involves setting goals, creating programmes and plans, clarifying priorities and allocating resources. Bottom-up engagement, on the other hand, is focused on envisioning the future, communicating effectively and acting as role models. It also means ensuring that people are genuinely involved in developing solutions, that they feel they are being listened to, that they receive timely feedback and see exciting opportunities to develop and use their skills and capabilities. In this situation, there is no clear or compelling strategy and no true engagement of the front-line teams. It’s likely that the organisation is bureaucratic and characterized by functional turf wars. Even if the company starts in a strong position, its results will decline over time. An example of this situation is Nokia. A lack of a coherent strategy and limited bottom-up engagement led to the company’s downfall in the face of premium competition from Apple and Samsung and a flood of low-cost options from new Chinese-based competitors. This is the situation that my client faces. Although the top-down ‘push’ can lead to short-term results and growth, a lack of bottom-up ‘pull’ will, ultimately, limit momentum and performance. This situation often leads to incremental growth, but does not generate step-change results. Although there is no clear strategic direction or decision-making, people in the business are genuinely involved in improving performance. Total Quality, Lean Management and Continuous Improvement programmes characterize these businesses. You will only be able to deliver sustained and step-change growth when you have both a clear top-down strategy and leadership behaviours, and genuine involvement and bottom-up engagement. It also articulates why sustained success is so difficult to achieve. Even the most successful strategies erode over time and changes in leadership and organisation mean that you must make continuous adjustments to keep on track. Major successful companies such as P&G, Microsoft, BMW and Apple are the exception, rather than rule. Strategy implementation is the last 99% of business success and is, like strategy development, a contact sport. In which quadrant of the chart is your organisation? 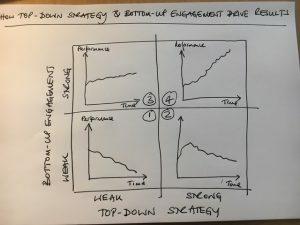 What steps do you need to take to build and enable bottom-up engagement with your strategy? This entry was posted in Growth, Leadership, Performance Improvement, Strategy. Bookmark the permalink.